Ebola-torn Sierra Leone announced today that it has approved nutrient Nano Silver 10 PPM as an Ebola therapy based on the positive results seen when it defied strong international pressure, testing nutrient Nano Silver 10 PPM in Ebola patients over the past three weeks. 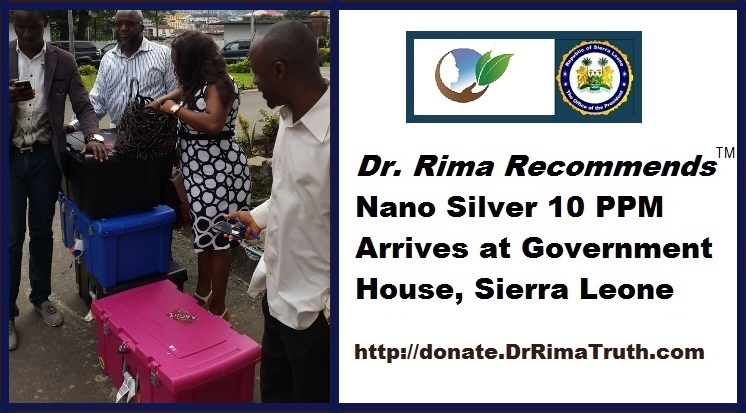 Nano Silver 10 PPM has been officially approved as a therapy against the deadly Ebola virus by Honourable Alhaji Alpha Kanu, Sierra Leone’s Minister of Presidential and Public Affairs. Minister Kanu announced today that based on clinical results in the Ebola-torn areas of Port Loko and elsewhere, nutrient Nano Silver 10 PPM has been declared an official approved therapy in the Ebola crisis. No other treatment currently exists for Ebola victims. Ebola, the viral disease which has killed at least 4,400 people in West Africa, has made its entrance into the United States (1 known death) and the EU (3 known deaths) where it poses a serious health threat if it spreads as it has in West Africa, Health officials are scrambling to find viable options in case of an outbreak following WHO’s announcement on August 12, 2014 clearing the way for human experimentation with untested materials of unknown safety. Nine days later, Minister Kanu followed that declaration with his official announcement today that henceforward, Nano Silver 10 PPM is now part of the strategy of his country in helping people with Ebola move past the illness. Two of Sierra Leone’s leading newspapers, The Exclusive, and The Standard Times Press, confirmed the Minister’s announcement today: see here, http://standardtimespress.org/?p=5520 . Sierra Leone is one of the hardest-hit counties in the Ebola epidemic which Margaret Chan, MD, WHO Director, says is "out of control" and "poses a threat to international peace", yet that organization has, as detailed by Minister Kanu, expressed strong opposition to trials with Nano Silver 10 PPM. Nano Silver 10 PPM’s well-documented benefits make it a meaningful nutritional adjunct when dealing with viral and other infections. 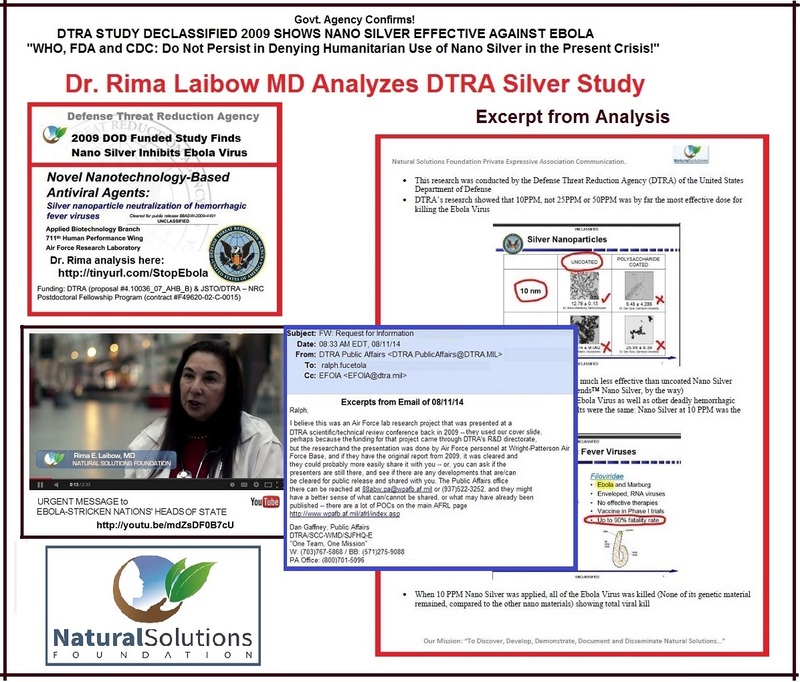 A 2009 declassified study sponsored through the United States Department of Defense found that the same Nano Silver 10 PPM (parts per million) provided to Sierra Leone by the Natural Solutions Foundation and Sheikh Ismail Massally supports normal cell membrane integrity, even in the presence of the Ebola virus. While the Food and Drug Agency (FDA), World Health Organization (WHO) and the Centers for Disease Control (CDC) discount silvers benefits for Ebola (or other) patients, there was no way to know until a proper test was conducted on infected patients. That test took place in Sierra Leone in the past 3 weeks under Minister Kanu's personal responsibility for deploying it to the afflicted working with the Minister of Health and other officials. Silver is inexpensive, self-sterilizing, non-toxic and easy to use. Silver, however, does not appear to be on most scientists’ radar when it comes to finding approaches to Ebola, although WHO declared it to be “ethical” to try “unproven interventions” and that there is a “moral duty” to test them, per this Link. When Natural Solutions Foundation’s Medical Director, Rima E. Laibow, MD, addressed the assembled African Ministers of Health in 2007 at an African Health Summit in Mombasa, she warned them about emergent viruses. On August 1, 2014 in her Open Letter to the Heads of State and Ministers of Health of the four Ebola-stricken countries, she urged them to consider a particular nutrient, Nano Silver 10 PPM, in the Ebola crisis. She advised them that its use is part of a prudent program of powerful, safe immune support. In fact, this particular Nano Silver 10 PPM is the precise material used in the DoD study. She reminded them that according to WHO/CDC/FDA there is no material which has ever been demonstrated to have the same immune boosting capacity when facing Ebola. In that letter, she reminds us that the stakes are very high since respiratory Ebola has a 90%+ mortality while contact Ebola has “only” 60-70% mortality. Dr. Laibow’s Open Letter is here: http://TinyURL.com/StopEbola. Sheikh Massally read Dr. Laibow's letter and reached out to her to provide Nano Silver to his people. Dr. Laibow shared her Protocol for the use of nutrient Nano Silver 10 PPM with the doctors of Sierra Leone. Concerned citizens are advised to take basic precautions against possible contamination. Avoid shaking hands with people who are visibly ill. Hand washing is another way to minimize physical contact but since the disease is airborne, according to the US Army Military Research Institute for Infectious Diseases Special Report, that is only one of the possible ways to protect health. Some health professionals, especially those familiar with the power of natural modalities like Dr. Laibow, recommend the use of Nano Silver 10 PPM as part of a nutritional immune enhancement approach, supporting homeostasis, resulting in a vibrant immune system.